People who know me well will be surprised to know that I attended The Leadership Summit 2009. It’s organized by The Willow Creek Community Church, a 7,200 seat Evangelical Christian church in Chicago and this year was broadcast via satellite link to 144 sites around North America. 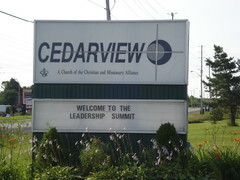 I attended at the Cedarview Alliance Church in Ottawa, invited as a member of the media (through a connection) for my Electric Sky podcast (listen to The Leadership Summit 2009: Leaders and Followers). The program was built around the idea that leaders need to look beyond their own communities and disciplines for strategies and tactics to become better leaders. The summit was meant to reach leaders of the Evangelical Christian community and other church groups, though the conference was not exclusive to that audience. The founder of Willow Creek and The Leadership Summit, Pastor Bill Hybels even started the conference by noting that leaders of all communities are welcome whether or not they are Christian. With a lineup of speakers which included Chip and Dan Heath (authors of Made to Stick and the upcoming Switch), David Gergen (advisor to four US Presidents), Bono (singer from U2) and Tony Blair (former British Prime Minister), it was a consciousness-expanding event. Here are some of my key takeaways from the summit. Bill Hybels used the metaphor of rogue waves to describe the unexpected challenges leaders face and prove themselves through. He cited the economic crisis as one of those significant rogue waves that really put leaders to the test. The key takeaway from his session is that leaders need to make time to replenish themselves, that they lead at best when their buckets are filled up. Leaders need to build time into their daily schedule to re-energize. Pastor David Gibbons explored where good leaders come from. Leaders come from the fringes. They’re the misfits, not the masses. More importantly, David said that too much energy is put into selecting leaders that are visionaries. The world needs fewer visionaries and more relationairies because relationships trump vision. The biggest mind shift for me was Andrew Rugasira. Andrew is from Uganda and founded the Good African Coffee company. He is incredibly passionate that trade, not aid, will save Africa and wants to change the world view of Africa of being generally bleak to one that is filled with opportunity. “No country in the world has developed through handouts”, he said. Trade is the only way to build economies and trade pulls community out of poverty. It’s something I’ve heard many times before though never so powerfully. Perhaps the most engaging session was with David Gergen. Mr. Gergen was an advisor to four US Presidents (Nixon, Ford, Reagan and Clinton). His insights into the qualities and weaknesses of those leaders was fascinating. The most valuable piece of advice he gave was to “go fishing”, using the example of Theodore Roosevelt racing away to go fishing for one week to collect his thoughts before coming up with the idea for Lend-Leasing. Oh… he also said to not confuse motion with progress. Chip and Dan Heath told a number of stories they gathered as part of the research for their upcoming book, Switch. Among their stories was one about Tiger Woods, who, even after he made his mark in the PGA, wanted to improve his stroke. Leaders need to excercise their skills like a muscle. Former British Prime Minister Tony Blair said that the comfortable decision is the wrong decision to make. He also said to know your irreducible core — the thing you will not go back on. Your irreducible core is the thing that is so important to you that you are willing to walk away from your role as a leader if being forced to turn your back on your belief. Remember to look outside of your area of interest and discipline when working on expanding your horizons. Looking inward reinforces your weaknesses.